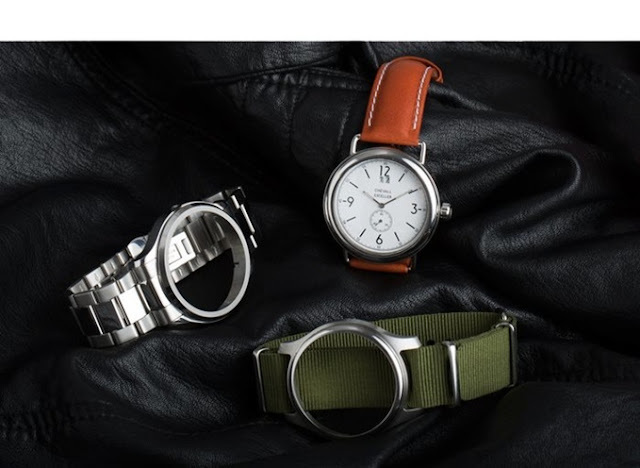 Recently, I discovered two crowdfunding campaigns for watches with interchangeable parts, both intended to give you one watch that can easily be transformed to create very different looks. They have taken different approaches to the challenge, with varying degrees of success. Chevall Watches is a new venture started by three young men from Slovenia now seeking funding on Kickstarter. They have designed a watch that houses the main components in a modular unit that can be removed and replaced in 20 seconds, enabling the owner to swap cases like they were straps. This is not the first modular watch. Fortis did it in the 1970s with the Flipper model (now reissued as the Colors) in which the owner could pop a quartz module in and out of colorful plastic cases secured with an integral bracelet. It appears to be a sound idea. After all, watch nerds love variety, and the Chevall certainly provides it. Each package includes a watch module and three different cases with straps and a bracelet. 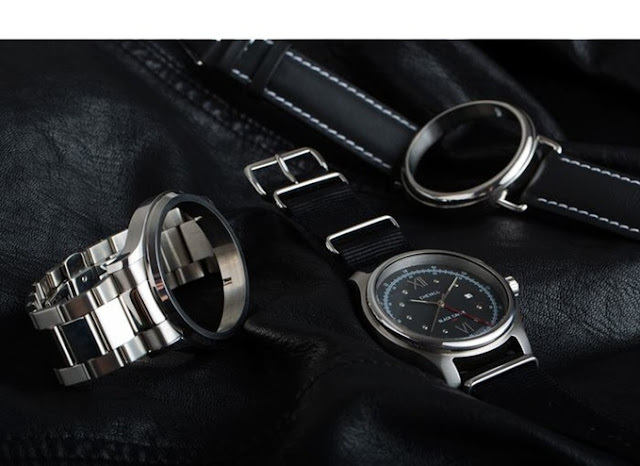 The stainless steel cases are attractive, although their 45mm size limits versatility. The "casual" case has a polished rounded bezel and simulated wire lugs on a 22mm leather strap. The "sport" case is brushed with a slim polished bezel, and a 22mm nylon NATO strap. The "classic" has a polished upper surface, beveled bezel, and thinner lugs than the "casual" case to accommodate a 24mm bracelet. Four dials are offered: a black Roman numeral GMT with a Ronda 515.24H, a pair of black and white Arabic field watches with the Ronda 6004.B and a dressy white Roman numeral dial with a Miyota 8215 automatic. All have sapphire crystals and 100 meters water resistance. Pricing is very good, starting around $200 for the quartz and $229 for the auto. While I like the concept, I think the execution falls flat. Yes, the cases are different, but not enough to justify changing them. I think the strength in this design is the ability to get radically different cases to create entirely different looks, not just minor tweaks. I can envision popping that black field watch dial from the polished wire lug case into a matte black military case on a NATO, and then a brushed tonneau with a bracelet. A variety of markedly different cases would make the package more appealing. As it stands, the current designs are pleasant, but a bit staid, and lean towards an oversize dress/casual look that I find very limiting. So far, the project has been slow to fund, but if it fails this round, I hope the Chevall guys will take it back to the drawing board and come back with some new and more aggressive designs. There is a good idea in here, but it may need a little more development. Over on Indiegogo, 0815 (pronounced "zero eight one five" - the "0" is not silent) has decided to tackle modular watch design with user-swappable bezels. Buyers can get an ash gray dial on a brown leather strap or black dial watch on black leather. The watches appear to be the typical crowd funded minimalist design, with applied baton markers, and a round, lugless case, but they have not been ruined with silly text or logos on the dial, just a small and simple 0815 printed at the top. Both base watches come on 20mm black leather straps. The bezel system looks easy enough, simply snapping into place with a twist. Four options are offered: polished steel, brushed copper, gunmetal, and tactical black. The copper looks great against the ash dial. It is not solid copper, but a PVD coating so it is doubtful that will develop any verdigris patina, which may be an asset or a liability, depending on your taste. The tactical black is my favorite because it is deeply dished for dramatic effect. The 0815 is 42mm across and powered by a Swiss Ronda 763 quartz movement. Water resistance is only 30 meters. 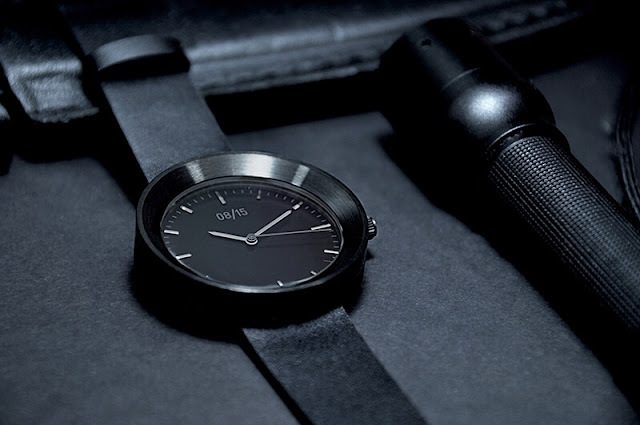 It is a simple design, but clean, uncluttered, and the bezel system sets it apart from the hordes of other minimalist quartz watches vying for your crowdfunded dollars. 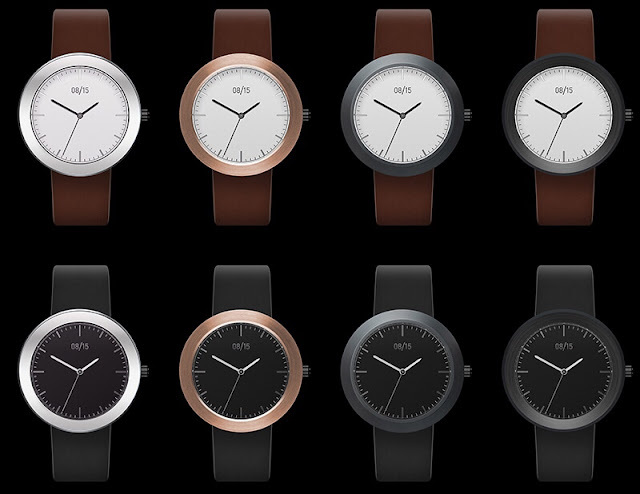 Early backers can get one watch base and two bezels for a modest $79 investment. 0815 has already surpassed their funding goal, so the first four bezels are a go. I'd like to see them hit their stretch goals and unlock the Carbon Fiber, Marine Blue, Whiskey, and Chardonnay bezels – but the funding targets are rather ambitious. Still, this is a clever concept, well focused and priced right.